Click here for Access "2007', "2010", "2013" or Access "2016"
1. 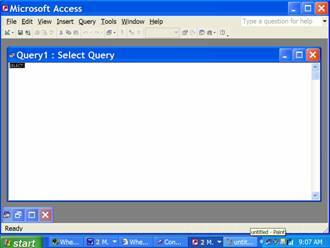 After launching Microsoft Access, either select open to open an existing database or select new to create a new database. If you are creating a new database, you must create and save a name for your database. 2. After selecting or creating a database, click Queries on the left, and then click on the "New" button located near the top of the screen. 5. Select the View button near the top of the screen. Note: When you place your cursor over a button, the name of the button is displayed. 8. To run a command click the "Run" button. Note: The run button is a red explanation mark. 1. 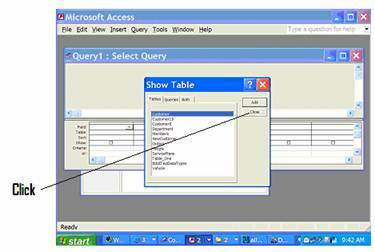 After launching Microsoft Access, either select "more" to open an existing database or click "Blank Database" to create a New database. If you are creating a new database, type a name (any name is fine) for your database in the “File Name” box. Next, click the “Create” button. Note: If you are selecting an existing database (i.e the downloaded course database), browse (locate where you saved the database on your computer) for the database after you click "more". 2. Once Access opens, Click “Create” from the menu running across the top of the screen. 3. Next, Click the “Query Design” button. 4. You'll see a “Show Table” dialog box. Click close on this dialog box without selecting any tables. 5. 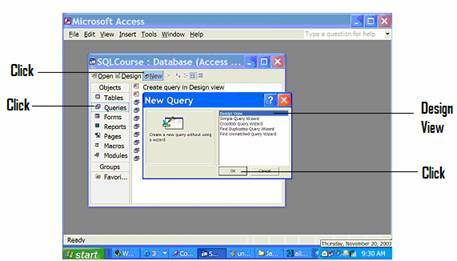 Select the “SQL View” or “SQL” button near the top left of the screen. 6. 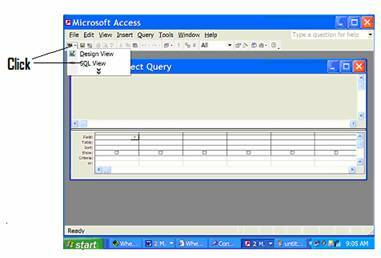 Use the "SQL View" or “SQL” button to select “SQL View”. (Click the down arrow located on this button to locate “SQL View”). 7. Type your SQL commands in this view (SQL View). To run a command, click the "Run" button.